For a significant percentage of the workforce and vulnerable households living in Greater Washington, housing affordability is a challenge, and as such that challenge poses threats to our long-term regional vitality and prospects for economic growth. Over the years, a considerable amount of research has identified, reviewed and documented the tools and strategies needed to develop an adequate supply of housing that’s affordable, and to preserve affordable assets that we currently have as part of our housing stock. 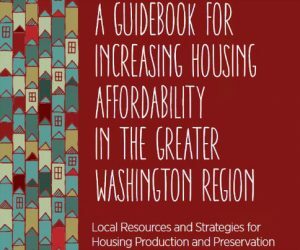 Now the Greater Washington Housing Leaders Group has released A Guidebook for Increasing Housing Affordability in the Greater Washington Region, a report that brings all those resources together in one place. Advocacy Tool – The report serves as an effective advocacy tool and a starting point for discussion among community stakeholders on how to advance more robust public policies for housing. What tools have been adopted by your jurisdiction? If policies are in place, are there limitations on implementation; could the policies be modified or expanded to be more effective? What are the obstacles (legal, regulatory, NIMBY) faced by a jurisdiction in adopting a particular strategy or tool? Can we use this comparative analysis to push for greater regional response to unmet housing needs? Do we have the political will to address this issue that threatens our viability as a region?